A laptop or computer is the most important thing for writers to digitize their creativity into words and having the best laptop for writers can take it to the next level. Before stepping ahead, I recently shared some of the top laptop for blogging you may love to check. So, what’s mean by the “best writer’s laptop”? Is it mean high speed processor, robust graphics, ample RAM, and massive storage? Of course NO. It is not necessary to have that kind of beast under your fingers for writing. But some sort of YES as well. It also depends on your pocket that how much you can spend because a mid-range computer for writers can do anything you may require. You can take more benefits and improve productivity using a machine which executes tasks fastly instead of waiting for minutes. A slow laptop can kill your creativity and irritates you to produce something unique. For example; a couple of months ago, my laptop had an issue in the motherboard, and I was unable to use. The technician said you’ll have to replace the motherboard with a new one. So, I got another machine with 2 GB RAM, and 2.1 GHz processor (I guess) and 320 GB hard drive. It was deadly slow, the biggest problem was browsing experience. Suppose, if I had open ten tabs, left them inactive for 10 to 15 minutes, and when needed to visit them for research, the browser had required a refresh for each tab. That was super frustrating. The most affordable and top-rated laptop for writers, packed with 7th Gen. Intel Core i3 7100U processor at 2.4 GHz cloaking speed, 4 GB DDR4 RAM, and giant 1 TB hard drive. This machine has everything that a full-time writer, blogger, or hobbyist content creator needs for robust performance. I believe you cannot get a better laptop than this one within the same price tag with such specifications. It comes with 15.6″ full HD widescreen display with ComfyView LED-backlit and delivers stunning graphics by utilizing Acer ColorBlast technology. Aspire E15 offers excellent viewing experience than other machines in the same range. Another impressive feature that lures buyers is its standard full size keyboard with backlit to help you keep writing in low light. Usually, such feature only comes in expensive machines but Aspire E15 support it. Not only that, the distance between keys and travel space is also ergonomics. The built quality is quite fine, rugged, and solid enough to bear shocks, and vibrations while traveling. So, you can take benefits while enjoying long rides, drinking coffee in the cafe, parks, and where you love to. The single power recharge provides an unbelievable 12 hours of battery life. HP Notebook 15 is another great choice for writers and bloggers. It has 6th Generations Intel Core i5-6200U dual core 2.3 GHz processor that can be boosted up to 2.8 GHz with Turbo Boost technology and 8 GB of DDR3L-1600 RAM which in return offer outstanding and reliable performance. You get a massive 1 TB mechanical hard drive with the spinning speed of 5400rpm for fast read/write and data transfer speed. So, with these high-end configurations, you can multitask or research online while 15 to 20 browser tabs open without facing any performance issue, it works seamlessly and can handle such load easily. An exceptional 15.6″ supports full HD anti-glare WLED backlit display technology with the max. resolution of 1920×1080 px. The Intel HD Graphics 520 chip with up to 4169 MB memory is capable enough to handle all the heavy graphical load and also deliver detailed video and photo quality as well as web browsing experience. When we talk about the best writers laptop, how one can forget keyboard? Well, you get a chiclet-style full size keyboard along with numeric pad which might be essential for some users, apparently who type numbers frequently. It comes up with pre-installed Windows 10 Home Edition and HP support assistance to get help from experts when needed. Other notable features are; CD/DVD writer, HD camera, DTS sound speakers, 3 USB ports (1x USB 3.0 and 2x USB 2.0), powerful 802.11 ac WiFi, and Bluetooth. Concerning battery timing, it can run for up to 7 hours and 15 minutes with one recharge. The overall weight 4.7 lbs feel a little bit heftier which might be a problem for some users regarding portability. 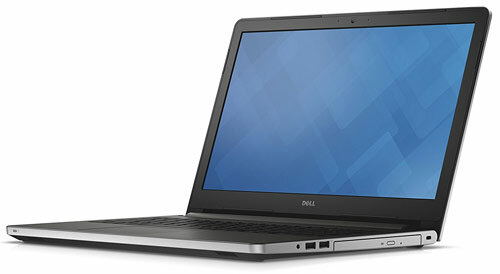 Dell Inspiron i5567 is also an affordable best laptop for writers and power bloggers with charming design available in the market. It is a mid range laptop with slightly powerful components that can easily handle dozens of browser tabs. It built with 7th Generation Intel Core i5-7200U processor clocked at 2.5 GHz and can be boosted to 3.1 GHz with Turbo Boost feature and 8 GB of DDR4 RAM. Talking about storage space, you can store an immense amount of data such as photos, videos, documents, and softwares, etc. in 1 TB SATA hard drive (spins at 5400rpm). You can also utilize Photoshop, Illustrator, and Lightroom editing softwares with its Intel HD Graphics 620 chipset on Truelife enabled 15.6 ” display panel. Keep in mind, Core i5 it doesn’t have Full HD panel and supports only HD 1366×768 resolution with LED backlit display screen. However, you can choose from AMD A9 and AMD A12 CPU’s to get FHD screen resolutions. This model comes with different specifications and prices. So, choose the appropriate one. It has a standard full size keyboard with numeric pad and backlit as well to enhance your productivity even in dim light. Plus, also included one USB 2.0, two USB 3.0, DVD drive, fast 802.11ac WiFi connectivity, SD card slot, Bluetooth, HDMI port, and RJ-45 Ethernet network. It runs pre-installed Windows 10 Home OS and can deliver 5~6 hours of battery backup. If you’re searching for a rock solid, sturdy yet luxurious laptop, then Apple 13″ 2017 would be a perfect choice. Though it costs too much but, you get a machine with robust performance and high-end system specification which makes it the top laptop for writers. Due to high price tag, I have not listed it in the first place – but professional writers should choose MacBook Pro. It equipped Intel Core i5 3.1 GHz dual core processor which can be boosted to 3.5 GHz speed with Turbo Boost, 8 GB 2133 MHz DDR3 RAM, 256 GB solid state drive, and Intel Iris Plus Graphics 650 display chipset. Plus, it also has a stunning and beautiful latest looking touch bar and Touch ID feature. The 13.3″ screen support 2560×1600 pixels resolution and backed by LED-Lit display technology which means a remarkable graphics experience while editing and watching videos. It has the best in class graphics technology than previous models which is another PLUS. You can choose from two colors, space gray and silver along with different system specs. Technically, writers can go for a low priced laptop because mostly they don’t need such higher specifications. Why? They just need a laptop which can run MS Office or any editor software to craft articles, right. Although, if you use Photoshop or any graphic editing software which requires high system resources, then this one would be a perfect choice. 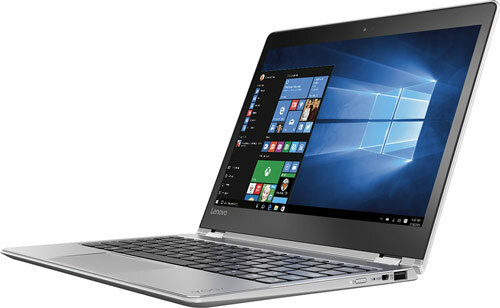 Lenovo Yoga 720 is a 2-in-1 convertible lightweight laptop for writers so that they can use it in two modes; as a laptop or tablet. It packed with 7th Gen. Intel Core i5-7Y54 processor @3.20 GHz cloaking speed and DDR3 8 GB RAM along with 128 GB solid state drive for splendid speed. It has 11.6″ FHD screen panel featuring IPS technology and LED backlight with 10 points multi-touch feature allowing you write via fingers or stylus. With built-in Intel Graphics 615 processor, you can use photo editing applications such as Photoshop to create attractive images for your blog posts. When it comes to keyboard and mouse pad, Yoga 710 consists of larger mouse controlling area and user friendly keyboard with adequate spacing. You can adjust the screen to any degree as it supports 350-degree flip and fold design to take maximum benefits from it. Due to sleek and razor thin design, it lacks DVD/CD drive which is not a big deal for content writers in most of the cases. Portability is another major concern for writers, and you will be surprised to know that this powerful laptop for writers contains only 2.29 pounds and regarding thickness, it’s 0.6″ thin. It’s the coolest affordable machine within the budget that you can get for empowering blogging or freelancing. Are you a travel blogger and loves to explore beautiful places around the world? If so, then Microsoft Surface laptop is the perfect option for you. While traveling, the biggest issues we face are “Battery life” and “Portability, ” but with this best laptop for writers, you don’t have to worry about both problems because it caters an incredible 14.5 hours video playback and carries only 2.76 pounds weight. It’s one of the highest battery life providers in this list as well. The very basic model comes with 7th generation Intel Core i5 3.1 GHz processor, 128 GB flash drive, 4 GB RAM, and four decent color variations. You can also choose Core i7 with 16 GB RAM and 512 GB SSD storage option as well. It utilized Windows 10 S operating system which is exclusively developed for Surface product’s to deliver superior performance, security, and browsing experience. It has touch enabled 13.5″ PixelSense edge to edge display panel with 2256 x 1504 resolution which also supports multi-touch functionality and a razor thin bezel. You can use fingers or either Surface Pen to get maximum benefits out of it. You don’t get any dedicated graphics processor here, but still, it can render Adobe Photoshop and related softwares pretty smoothly. So, what about keyboard quality, is it friendly? Well, you get a graceful keyboard covered by Alcantara fabric with backlit which feels magnificent while typing. Moreover, you can adjust the brightness of backlit. The proper key distance and 1.5mm key travel make it the perfect choice for bloggers, journalists, writers, freelancers, and webmasters. Apple MacBook Air is quite an old model compare to all other laptops as it has 5th Generation processor. But, still popular among consumers due to slim & sleek, elegant, and stylish aluminum design which occupies only 2.96 pounds weight. MacBook Air 2015 comes with 5th Gen. Intel Core i5 1.6 GHz processor, 8 GB of LPDDR3 RAM, and 128 GB PCIe solid state drive to handle multitasking and all writer’s applications in decent manners. Nowadays, 128 GB is quite insufficient, so you should choose 256 GB variant to avoid problems regarding storage space in future. Moreover, its processor support Turbo Boost technology using which it can be clocked at 2.7 GHz. It has 13.3″ LED-backlit Glossy Widescreen display at 1440×900 resolution and doesn’t have Retina display. Still, offers bright colors and vibrant image quality with the help of Intel HD Graphics 6000 processor. Note that, Retina display doesn’t come in any MacBook Air model. Concerning about keyboard and mouse pad, you get an extended mouse pad and ergonomically designed full size backlit keyboard with sufficient key distance and decent key travel. So, you feel comfortable while typing and can easily type in the night or dim light. For peripherals, there are two USB 3.0 ports, 1 Thunderbolt 2, 3.5mm audio port, and SDXC card reader slot. MacBook Air as built-in 54 WH lithium polymer battery which allows you keep writing for upto 12 hours. It means distraction free environment without worrying about low battery level. 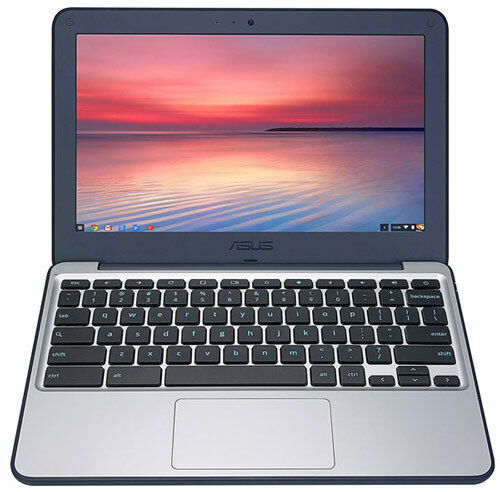 Asus Chromebook is one of the most affordable and cheap laptops for writers in this list and comes with Intel Celeron N3060 processor with cloaking speed of 2.48 GHz, 4 GB of RAM, and 16 GB hard drive. For smooth and speedy performance, solid state drive is used, though you get a small storage but enough for writers, bloggers, and freelancers whose priority is writing. It has anti-glare 11.6″ display screen with 1366×768 resolutions and uses Chrome OS. So, you cannot install standard Windows MS Office, but built-in QuickOffice Editor can open/edit or create new files. Moreover, Google Docs also can be used for the same purpose. When choosing the best laptop for writers, the most crucial thing is its keyboard. Well, it featured 15% larger character printed keys and convenient key distance which feels comfortable while typing. Overall built quality looks awesome and reinforced rubber wrapped edges protects your laptop in case of any incidents. Asus Chromebook provides comfortable grip as reinforced rubber employed on the outer shell and also cover the machine’s surrounding. You can take benefits for upto 10 hours, carry easily anywhere due to light weight, small in size, and stay connected with robust 802.11a/b/g/n Wi-Fi connectivity. Plus, a mind blowing offer of Free 100 GB Google Drive for 2 years also included. So, you can store a lot of data without worrying about limited internal storage. So, Should you buy it? Well, if you’re looking for a writer’s laptop, extended run battery, an affordable solution then it would be a perfect choice. Regarding, heavy duty usage, please consider other options in this list. 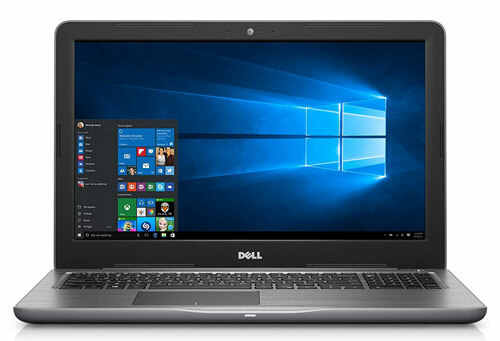 Dell Inspiron i5559 is a 6th Generation machine which packed Intel Core i3-6100U 2.3 GHz processor, 6 GB DDR3L RAM (1600 MHz), 1 TB hard drive, and comes in Silver Matte color. You can upgrade the RAM to a maximum of 16 GB. There are different variants available within the same model in Core i5 and Core i7 processors as well. High end (i5 and i7) machines also support Turbo Boost technology to handle heavy loads and can be clocked to 2.8 GHz, touchscreen as well as full HD display. It is a cheap laptop for writers with enough specifications to empower your writing or blogging needs. As it’s a basic model, so you get a 15.6″ HD TrueLife LED-Lit display with 1366×768 resolution. Dell Inspiron consists a full size keyboard with numeric pad and precisely designed touchpad. However, you may face problems while using up/down navigation keys. With an adequate key and travel distance, it provides excellent experience and accurate typing. 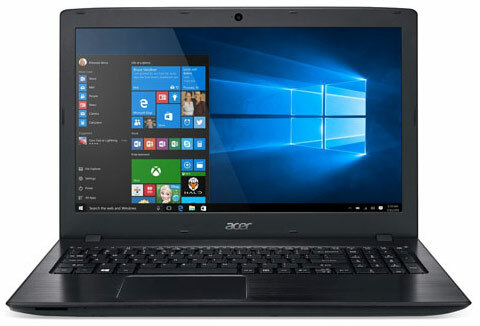 In short, you can get a pretty solid laptop featuring standard CPU components, Intel HD Graphics 520 chipset, three USB ports, Bluetooth 4.0, 802.11ac WiFi connectivity, tray loaded DVD drive, card reader, and pre-installed Windows 10 operating system. It consists of two USB 2.0 port and one USB 3.0 port for connectivity of external items such as USB mouse, keyboard, etc.It comes up with pre-installed window 10 operating system. When it comes to portability, the overall laptop weight is 5.4 lbs which is pretty heavier. The battery holds a charge for maximum 7 hours. 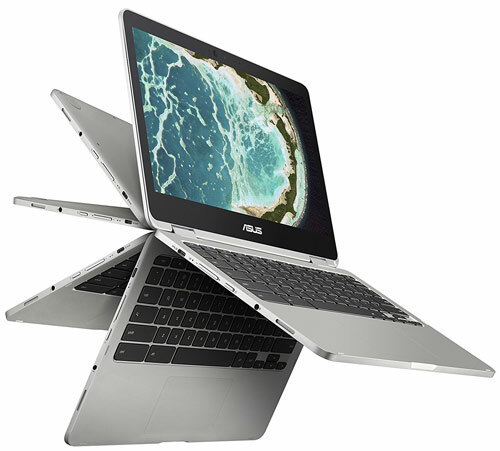 ASUS Chromebook Flip C302 is another good choice for writers due to its flippable hinge for comfortable usage at any angle. You can use it as a laptop or in tablet mode with its flexible 360 degree hinges. This laptop is very slim and light weight only consists 2.65 pounds and is coated with sleek aluminum metal body protection. It comes with Intel Core m3 2.2 GHz processor, 64 GB flash drive and 4GB RAM for fast and efficient performance. It featured clear and wide-view 12.5 inches full HD touchscreen with 1920×1080 resolution. Intel HD Graphics 515 chipset provides outstanding picture quality. It works swiftly and delivers smooth experience when we talk about multitasking. Furthermore, it has a built-in high quality Stereo speaker for an immersive experience and long lasting battery timing of 10 hours. It also has built-in antivirus protection and Chrome OS which makes your computer secure, safe and upto date. You can use HD 720p webcam while skyping with your clients. This machine comes with an astonishing LED one-piece chiclet keyboard making it comfortable to use in the dark. Furthermore, you can enhance the performance by utilizing 2 USB Type-C ports, Bluetooth, and fast 802.11ac WiFi connectivity. It carries only 2.65 pounds weight which means elegant portability. So, these are some of the top options when it comes to best laptop for writers that they can consider checking before buying. Although, there tons of laptops available with different specs and of course higher or lower price tags but you should address what is your use and how much CPU resources you need. That way, you’ll be able to pick the right laptop for writers but also can save significant money that you end up spending in wrong product. For normal use like writing, watching videos, browsing, and Photoshop, you can go with any MID-range machine having Core i5 processor and at least 4 GB RAM. But for high end users, I would highly suggest choosing a laptop which should have Core i5, 8GB of RAM, and SSD drive for robust performance. Please don’t hesitate to ask any question if you need further assistance in the comments section.